A few days ago, while hiking Aldis Hill, I noticed that several wildflowers were on the verge of blooming. Some them can take more than a week to open. Bloodroot and trilliums are a good example of this. But round-lobed hepatica, a humble member of the buttercup family, usually opens right away. So I went looking for it yesterday despite the rain. At Judy’s suggestion, I went to Niquette Bay State Park. It’s a good place to hunt for wildflowers this time of year. It’s right on Lake Champlain where Vermont’s northern climate is slightly milder. Dog friendly, too, which is good for Matika. Midweek, raining, and early in the morning, I was certain to have the place to myself. That sold me on it. I went. I noticed trilliums right away, but they weren’t open yet. A few Dutchman’s breeches had taken form, but they were still green. Patches of mottled green leaves caught my eye, but the trout lilies they sport were nowhere in sight. Not yet. I saw spring beauty drooping and closed against the rain. 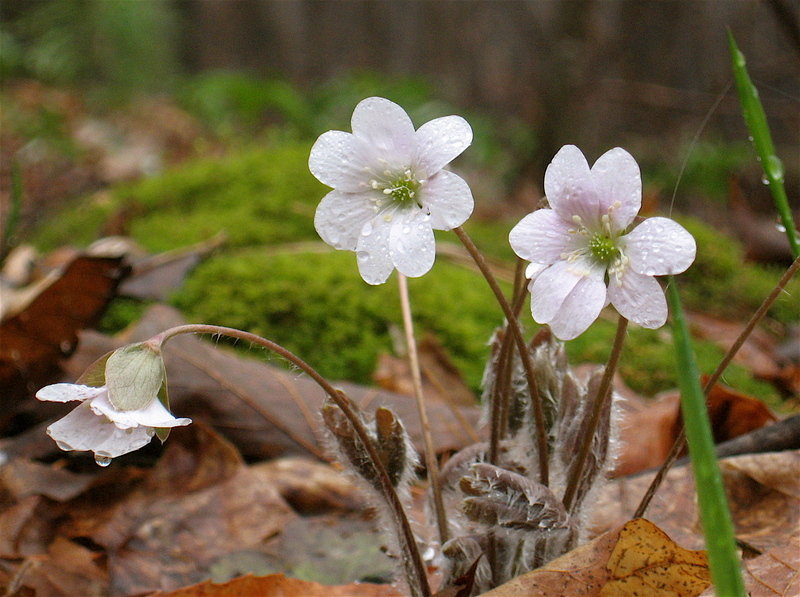 Then I found them, amid moss-covered rocks – the first wildflowers of the season pushing up through the forest duff: hepatica. To those of us who love all things green and growing, who simply endure winter, few things are more joyous than the first wildflowers of early spring. What a relief to see them. A smile broke involuntarily across my face while hungry eyes fell upon their delicate petals. A woodpecker knocked nearby, a hermit thrush sang in the distance, and insects buzzed about. No matter. The first wildflower of the season is what turned me. The world is reborn! With my wife’s old camera, a great improvement over the cheap one I’ve been using the past year, I snapped several pictures of the tiny flower. I didn’t mind lying on the wet, muddy earth while doing so. In fact, I rather enjoyed it. Then I went down to the water’s edge to ponder matters great and small before moving on. Matika chewed a stick to pieces while I sat there. Then we both finished the hike wet, wild and happy. The slightest flurry of snow blows into my yard this morning. Here in the North Country, winter is not quite finished with us yet, or so it seems. 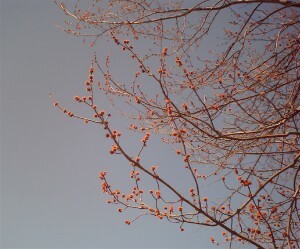 But the budding trees tell a different story. 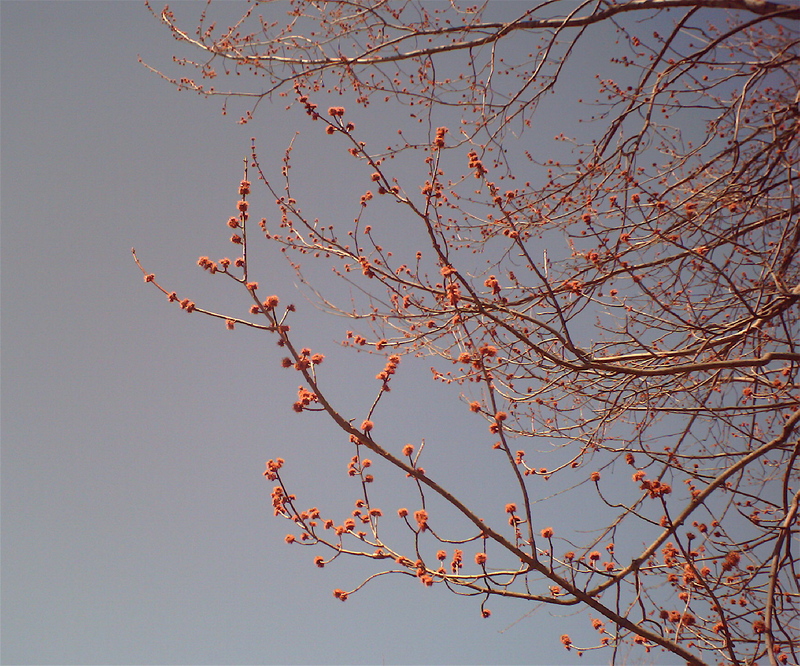 The other day I noticed catkins drooping down from poplars along the Rail Trail, then admired the intricate, reddish flowers of the silver maple in my backyard. The latter, illuminated by sunlight, were too beautiful for words – a true wonder of nature upon close inspection. I was well into my twenties before it dawned on me that all broad leaf trees are flowering plants. How could I not know this in my teens? I marvel at my inattention back then – how little I noticed the world around me. Oh sure, I saw apple blossoms and the like, yet somehow the smaller, more subtle tree flowers escaped my attention. I saw only barren branches and longed for the leafy, green explosion that was imminent. 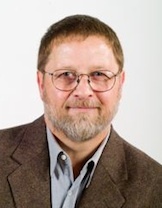 Most people become cranky and impatient in early spring. They pretty much stay that way until the trees leaf out, the lilacs bloom ostentatiously, and the first sunny, 75-degree day arrives. All the groundwork for the growing season is done by then. The songbirds and wild animals know this but somehow it escapes the vast majority of us humans. Why is that? These disproportionately large brains of ours separate us from the rest of Creation. That’s both our defining attribute and our greatest curse. Being human, we live inside our heads much of the time, preoccupied with abstractions, not seeing the obvious. I suspect that this is more the case now than it ever was – our infatuation with all things digital knowing no bounds. I like to think that I’m an exception to this rule, but springtime in all its glorious unfolding usually proves me wrong. No matter how hard I try, I always miss at least half of it. “Pay attention!” the cardinal sings from the treetop. The woodpecker knocks out the same refrain. All flowering plants, both herbaceous and woody, underscore it. Yet all I see on a chilly, gray morning like this is the ephemeral snow flurry. And all I can think about is summertime fun. It’s a crime against nature to be sure. After a week on the road, I wanted to reconnect with my home turf. French Hill seemed like just the place to do that, so I parked my car in front of a closed gate yesterday and tramped into the quasi-public reserve there. I went looking for signs of spring, of course. It’s that time of year. Matika ran about, wild and free. She was absolutely elated to be in the woods again. My reaction was a bit more subdued. I felt relief, pure and simple. The world is mad. The quiet forest is the only thing that makes any sense to me. Nearly a thousand feet above the Champlain Valley, the high rolling ground around French Hill is still recovering from winter. 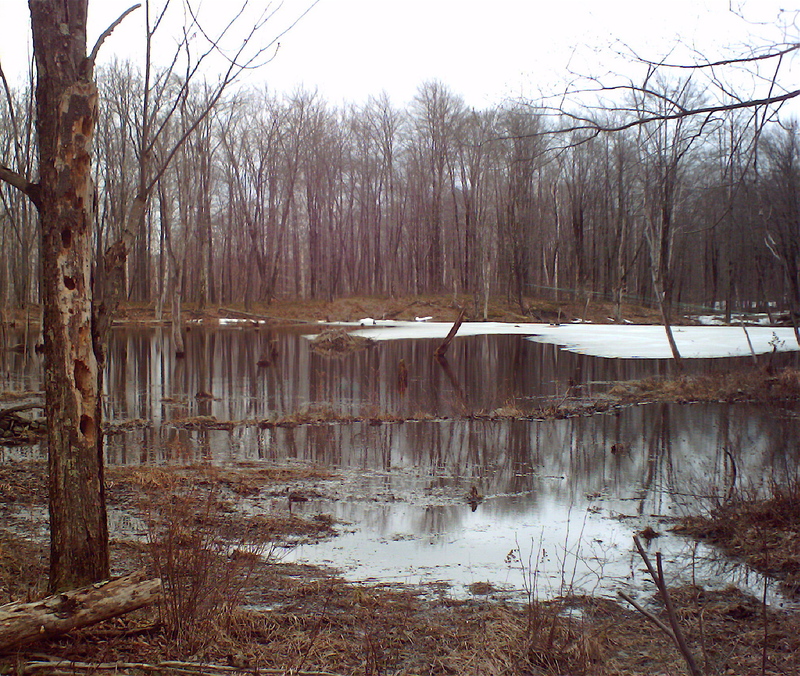 Patches of snow linger on the forest floor, and both beaver ponds are still half covered with ice. I visited the larger one first since it was close to the logging trail. My boots sank deep into the mud. My tracks filled with water. Here in Vermont, you don’t enter the woods this time of year unless you’re okay with mud and water. A few peepers chirped from the edges of the large pond – hardly the chorus I had hoped for. Spring is coming late this year, thanks to all the snow that fell this winter. That’s okay. It felt good to have soft earth underfoot regardless. I had to bushwhack to reach the smaller beaver pond. I followed the tiny stream flowing down from the larger pond then approached smaller one slowly. Three mallards were floating there. I didn’t want to disturb them so I kept Matika behind me. Woodpeckers had been busy digging in a dead tree along the edge of the pond. 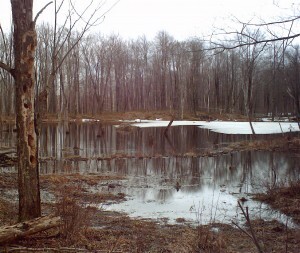 The beaver lodge on the far end of the pond had a few new sticks piled on top of it. The mallards swam over to the icy half of the pond then went for a short walk. I watched them for a while before following a fresh set of deer tracks back to the logging trail. Matika and I spooked the deer a few minutes later. Before leaving the smaller pond, I found the bright green shoots of false hellebore breaking through the forest duff. I almost stepped on them. Didn’t think much about it until I reached my car, but those shoots were the first new vegetation I’ve seen in the Vermont woods this year. 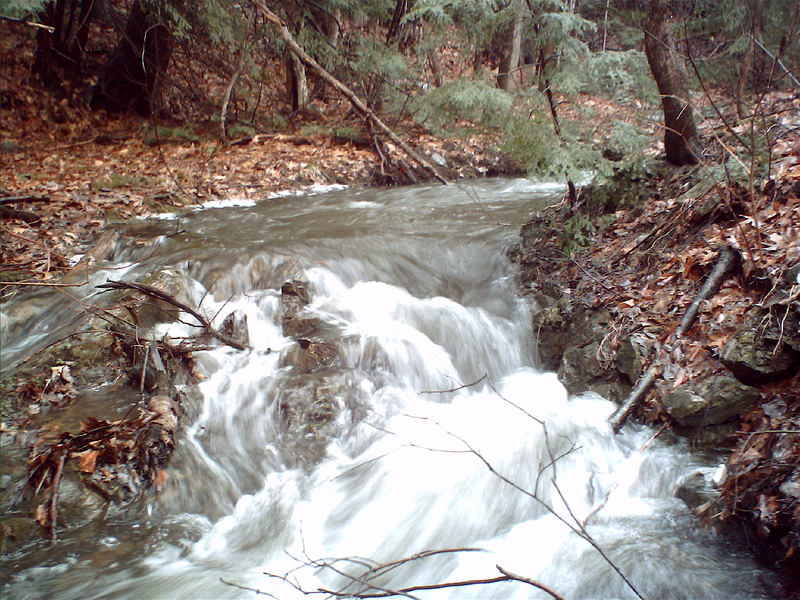 John Burroughs once wrote that the first signs of spring are always down low in the wet spots, not on the high, dry ridges. It makes sense really. After all, mud and water is what early spring is all about. Undaunted by the cold rain falling all day long, my dog Matika and I head for the woods. Just a short hike in the middle of indoor busy-ness. No biggie. I’m excited all the same. The last of the snow in my front yard melted off yesterday so it looks and feels like spring to me now. I can see the ground again, anyhow. This isn’t the kind of warm, sunny day that most people fantasize about in late winter but it suits me just fine. I like the rawness of April here in the North Country – the muddy starkness of it, the roughness, the attitude. And the dampness doesn’t bother me. With pants tucked into boots, rain jacket over several layers and a waterproof hat, I’m ready for a seasonal baptism. Bring it on! The trail is clear for the most part. There are still patches of snow scattered throughout the woods but my eyes gravitate to the earthy places where evergreen wood ferns are still pressed to the ground amid the leaf litter. Along the banks of a feeder stream roiling with meltwater, the moss clinging to rocks is slowly coming back to life. 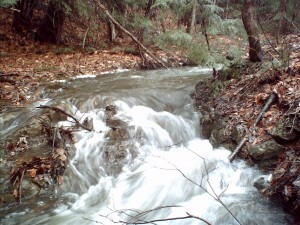 I revel in the steady roar of water rushing downhill. It is winter’s way of saying goodbye. The temptation to wander through trackless woods is too great. I leave the trail. With each step my boots sink into the saturated ground. Raindrops filter through the trees, falling quietly into ephemeral pools fresh with snowmelt. In the middle of all this wetness, I squat down for a moment to let it all soak in, literally. Then I catch a whiff of thawed earth and something stirs deep within. Matika is wet, happy and running wild through the forest. So am I. By the time Matika and I get back to the car, we are soaked. No matter. We’ll have the rest of the day to dry out and warm up. The important thing is that we’ve made an elemental connection with the world, inaugurating the season. And you can be certain that we’ll get out there and romp around again just as soon as we can.